Enjoy a quality service from an experienced company, and select bathroom worktops cut to size. We provide a cutting worktop service which means all you need to do is select the perfect worktop for your kitchen, or bathroom, and allow us to do all the hard work for you. Cutting kitchen worktops can prove expensive if you aren't experienced, which is why it is imperative that you employ a company that has extensive knowledge of cutting kitchen worktops. For further details about our kitchen worktop cutting service, Call and speak with one of our highly trained advisers. HC Supplies are proficient in providing laminate worktops cut to size, wooden worktops cut to size, oak worktop cut to size, and all other types of worktops found in our extensive collection. Why worry about cutting worktops when our professionals can provide quality bathroom and kitchen worktops cut to size at extremely competitive prices? We provide many different designs of worktop cut to size, including big brand names of the highest quality. Breathe new life into your kitchen with stunning wooden worktops cut to size to perfectly fit the measurements of the space. Enjoy discounts and purchase a designer kitchen worktop cut to size. We are renowned for worktop cutting services and the precise workmanship provided on each occasion. Visit the only retailers you need for kitchen worktop cutting. Our cut kitchen worktop designs ensure you have the ideal cut worktop. Cutting laminate worktops, and cutting solid wood worktops can be a tricky task, making our cut to size worktops deals the ideal solution. Discover laminate kitchen worktops cut to size today. Once you have chosen your ideal kitchen worktop, enjoy swift delivery within 2 to 7 working days to your UK address. Do you need your purchases delivered on a certain day? Take advantage of our specific day delivery service and have your items delivered on a day that suits you. Simply speak with one of our friendly advisers who will arrange the safe delivery of your new kitchen and bathroom worktops on a convenient day for you. HC Supplies are also delighted to be able to provide overseas delivery to our customers, so if you need to refurbish your property abroad, get in touch and we can arrange everything on your behalf. 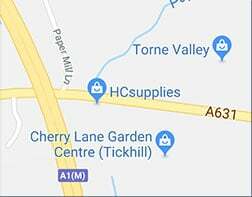 If you would like a closer look at any of our stock, or are in need of some design inspiration, pop into our Doncaster showroom and see just how stylish your home can look when you purchase your kitchen or bathroom worktops from HC Supplies. Customers living ithin a 30 mile radius of our DOncaster showroom are invited to experience our design packages, ensuring you make the most out of the space you have in your home. To find out more, give our customer services team a call, or contact us via the online form today.